I then did some Internet research and came across this idea as a way to launch into an investigation: I liked this as a way to keep students coming back to the purpose of their investigation…which offer would you choose? 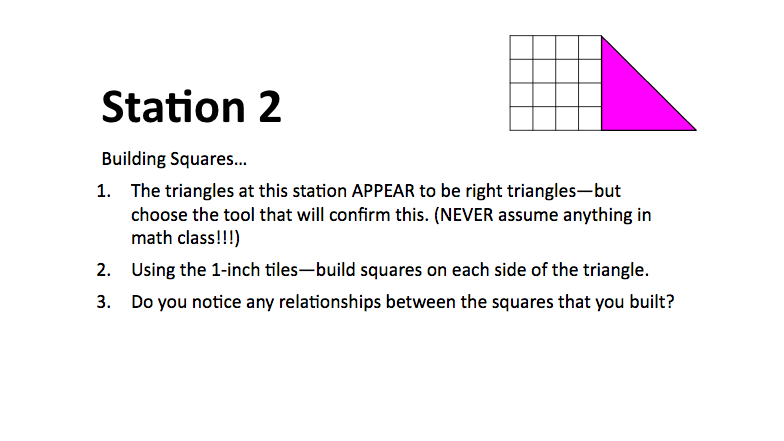 I decided I wanted students to experience multiple ways of looking at the relationship between the areas of the squares on the sides of the right triangle…so I developed three different stations. 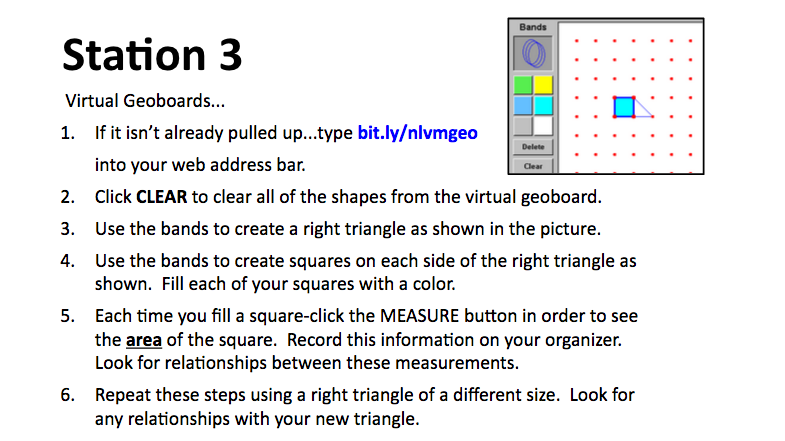 The Google Drive folder with the materials for this Discover Pythagorean Stations is here. You should make a copy of the materials so that you can edit and make your own. For this activity, I would definitely get another set of hands in the room (I was the second set of hands in my building). We ran 2 groups of each station…so that you can split your kids up into 6 groups. For the NLVM site…make sure the computers you get are up to date with Java. You need to do this prior to doing the activity. (For groups of 3-4 we used only 1 or 2 computers at each of these stations–kids worked together). Kids will need the most help on the computer station and the tangram station. 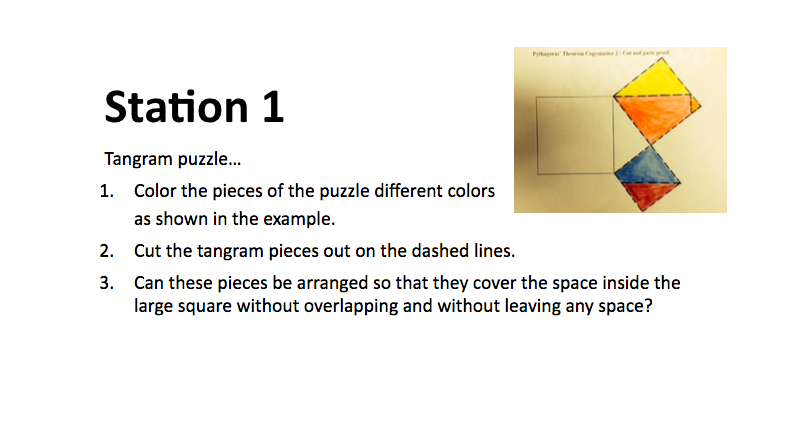 Here is the answer key for the tangram station (if kids struggled…I would get them started with the big red piece location). For the recording document…I tried to get them to consistently draw a sketch of what they saw with any quantities that were important to figuring out which students chose wisely re: the gold. I kept coming back to what we were trying to figure out. 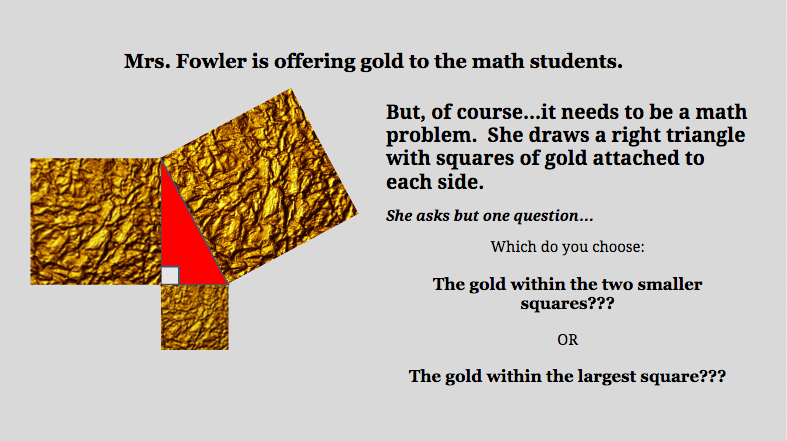 Who made the best decision…two smaller squares of gold or the one large square of gold. Kids figured it out after the first station…and their a-has were priceless. I still think it was useful to work through each of the three different ways to look at it. So at the end, I asked them to reflect on what they learned and which station was most effective for their learning.